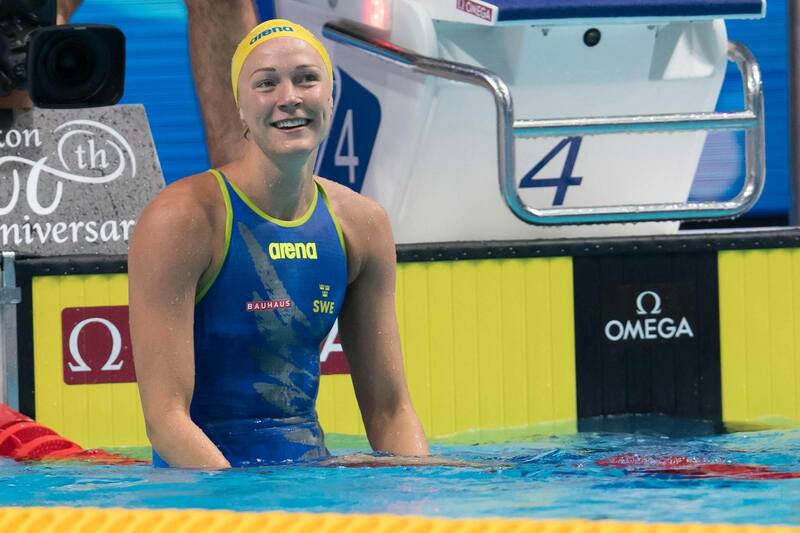 Busting out the 2nd fastest time in the world this season in the women’s 200m freestyle, Sweden’s Sarah Sjostrom kicked off her Nordic Tour campaign breathing fire. After registering a casual morning swim of 2:00.35 in heats to capture the top seed, the 25-year-old multi-Olympic medalist cranked out a massive 1:55.44 to take the meet title here in Helsinki. Opening in a swift 55.88 and closing in 59.56, Sjostrom scorched the field here at Mäkelänrinne, with the next fastest competitor represented by teammate Michelle Coleman and her mark of 2:00.19. Rounding to the top 3 was Iron Lady Katinka Hosszu, who touched in 2:01.14, jetting right into Helsinki from the Hungarian Nationals that just concluded over the weekend in Debrecen. 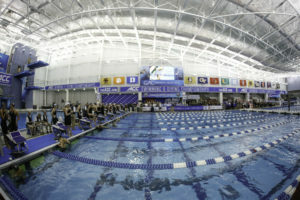 Sjostrom’s time sits only behind American Katie Ledecky’s 1:55.32 from Winter Nationals in the world rankings. In her 2nd win of the evening, Sjostrom cranked out her fastest time of the season in the women’s 100m fly. 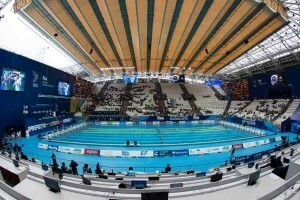 Splitting 26.67/30.36, Sjostrom hit the wall in 57.03 to represent the only swimmer under 58 seconds in the race. Kimberly Buys of Belgium was next in line, touching in 58.78 as the only other sub-minute athlete in the field. But Sjostrom still wasn’t done, as the ISL Team Energy Standard captain produced another big-time swim in the women’s 50m free. Sjostom powered her way to the top of the odium in 24.22, as well as the world rankings tonight. But also collecting multiple wins was Kosszu, with the Hungarian not only taking the women’s 200m IM in 2:13.72, but also clinching wins in the 200m back and 800m free. In the former event, Hosszu notched 2:11.76, although well off her 2:09,77 from Golden Tour Marseille. In the latter, the multi-Olympic gold medalist earned a mark of 8:54.33, a time outside the top 25. No one in the men’s 100m free was able to get under the 50-second threshold, with Sebastian De Meulemeester getting his hand on the wall first in 50.52. Louis Croenen of Belgium was just .02 behind in 50.54 for silver. Giedrius Titenis of Lithuania surged to the top of the men’s 50m breaststroke pack in 27.51, while visiting Australian Thomas Fraser-Holmes notched a 400m IM victorious outing of 4:19.00 to win by over 9 seconds. Jenna Laukkanen clocked 1:09.94 to take the women’s 100m breaststroke. Felix Ziemann was tonight’s 100m backstroke winner for the men, registering a time of 55.91. Austrian swimmer Caroline Pilhatsch came out on top of the women’s 50m back in 28.05. Croenen did damage in the men’s 200m fly, taking the gold in 2:00.59. Henrik Christiansen of Norway was tonight’s 400m freestyle victor, registering a time of 3:49.87, good enough for 16th in the world. ERik Persson got under 2:10 in the 200m breaststroke, stopping the clock in 2:09.62 for the gold. Finland’s Riku Poytakivi took the men’s 50m fly in 23.66 as teh only sub-24 second swimmer in the field. places him as 22nd fastest in the world so far this season. At this rate, she’d better not give up the 200 at the World and Olympic level. It’s stuck in that 1:54-1:55 range and she can blow that wide open with the speed she has if she wants to train for the back end of that race. I wouldnt go back if I was her. The event is *deep* now, a lot deeper than in 2016. Bonnet, Ruck, Titmus, hopefully Ikee all under 1.55 already. There are a couple other youngsters I expect to blow onto the 1.54 scene before Tokyo too. And nothing indicating she will. Always claimed 200 was there in LC only for training purposes. She feels that the 100 gets a lot easier with some 200 races under her belt. I’m with Dee on this one. She COULD medal at World/Olympic medal in 200fr but that’s far from a done deal given the competition she would be up against (Ledecky, Ruck, Titmus, Ikee, McKeon to start with) and 3 rounds of 200 will have its impacts on her 50 & 100fr later in the program which are better medal bets than the 200. It was worth her while to give the 200 a red hot go in Rio but the depth in the event has risen exponentially since even if the times haven’t moved on.